The Jack prophesied: If the king loses his head, then the Queen with a Bleeding Heart would rule the Red Court until Time ceased to move forward. When a second carried on for infinity, every creature in Wonderland would tip their Hat to the misfit girl with a Boy’s name (or was it a boy with a Girl’s name?) who’d end the Reign of Terror. However, it all hinged on the One-Eyed Hare being able to convince an uninspirable Heir that the impossible was indeed possible—like stopping time—and that Love was worth a Beheading. In the end, would it matter who Reigned? I specialize in dark, paranormal romance – think “happy ever after” but with a twisted, dark chocolate center. Real-life romance isn’t only filled with hugs, kisses, unicorns, and rainbows. True-love can be more thoroughly described in times of darkness and tribulation. It’s in those harsh moments where you see what a person is truly capable of – both the good and bad. Sometimes prince-charming isn’t always on time, and the glass slipper is a little snug. However, it doesn’t mean Charming is not Mr. Right, and who says every shoe is the perfect fit? Holy craptastic trip to Wonderland! As a person who claims that Alice In Wonderland is one of their fave cartoon movies of all time, I had some seriously high expectations for this novel. I was skeptical... duh... I mean, it's Alice! I was BLOWN AWAY. I had no freaking clue how the author would turn this into something that didn't feel like a total copy-cat novel. It was flippin' amazing! Ahhh! *Pulls at hair and stares at the screen* It's so hard to describe this one with words! There are characters that we all know and love, and then there are new characters that we grow to love or hate. The Queen of Hearts, of course, is her nasty self. 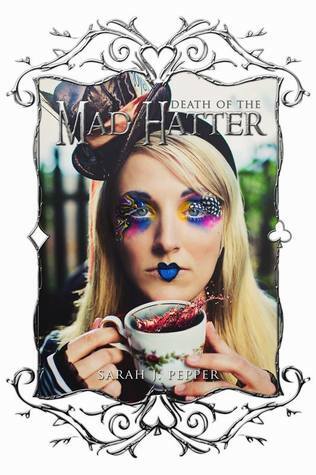 The White Rabbit, the Mad Hatter, and of course Alice - to name a few. Then you throw in the new characters and it becomes this brand new story with similarities to the original! I feel like I'm rambling a bit but it's because I honestly don't know what to say and not say. It was such a fascinating read and I loved the plot. It kept me on my toes. Above all, the creativity put into Alice's character and some of the new quirks made the novel for me! The candy! Ah! I want a piece - just to try it! The spin on the candy is a great touch! To know that one can become certifiably insane if they're in the "real" world but they're from/or spent much time in Wonderland without it... LOVE that. I would honestly love to see this version on the screen. I think it would be fun to watch unfold on the screen! Great creativity, great flow, great twists on the characters, and great plot! Cover Rating: 5 Stars <- Love it! Ending: 5 Stars <- Woah! There were the types of girls who dressed for guys, the type who still played dress-up, the type who lived in sweatpants, and then there was an entirely different breed who wore mismatched socks with pride. This chick fell into the last category. Why anyone could possibly think bright orange and blue would go together, unless they were a Boise State fan, was beyond my thought process. Her shoes were quite possibly handcrafted a hundred years ago, and her tattered skirt looked as though she found it in a dusty box tucked away in an attic. However, the zebra patterned gloves actually appeared to be from this decade. “Bunnies, rabbits, hares—rumperbabbits. Same thing,” she said with a wink. She had the most volatile light-blue eyes that were so electrifying I couldn’t look away. Time out—just for reference, I didn’t believe in juvenile notions, like love at first sight. In my book, time didn’t cease to move forward when two people fell in love. As a matter-of-fact, I’d have to be drunk (not on love) for such an irrational thought to enter my mind. But, there was something magical about her. A mischievous charm. I wouldn’t have said that I necessarily liked it, but it was intriguing. She was intriguing… and new. For a town whose newspaper’s biggest story was the harvest report, having a new girl in school would most likely be headlined on The Gossiper’s front page.